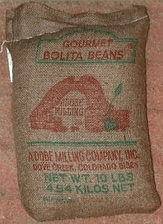 Adobe Milling Dove Creek, Colorado: Gourmet Beans of all kinds for great Southwest Cooking! Welcome! And thanks for visiting us! Adobe Milling brings the warmth of Southwest Colorado into your kitchen! Take a stroll around our site and see all the great products we have to offer, Cookbooks, gourmet legumes ranging from anasazi and bolita to pinto and black turtle, hot sauces and more! 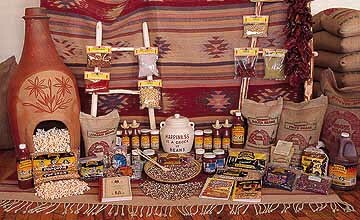 We started Adobe Milling back in 1983 because we live in the heart of the “Pinto Bean Capital of the World.” We began with just beans, and over the years added other tasty Southwestern delights to create the full line of Adobe Milling Products shown in the picture above. Try some when you place your next order! We're perfect for birthdays, holidays, gifts and special occasions. We ship ground UPS or two-day air, so filling last-minute orders is no problem. We also have an assortment of gift packages available complete with additional southwest accents, ready for those special someones in your life. We can also help with additional gift ideas.